When Kobas was initially conceived it was a Cloud based service which, among many other goals, aimed to aggregate sales information from any EPoS system. While this worked well in principal we found some EPoS providers to be more reserved than others when it came to exposing sales information for integration purposes. Tricky, was the short answer. 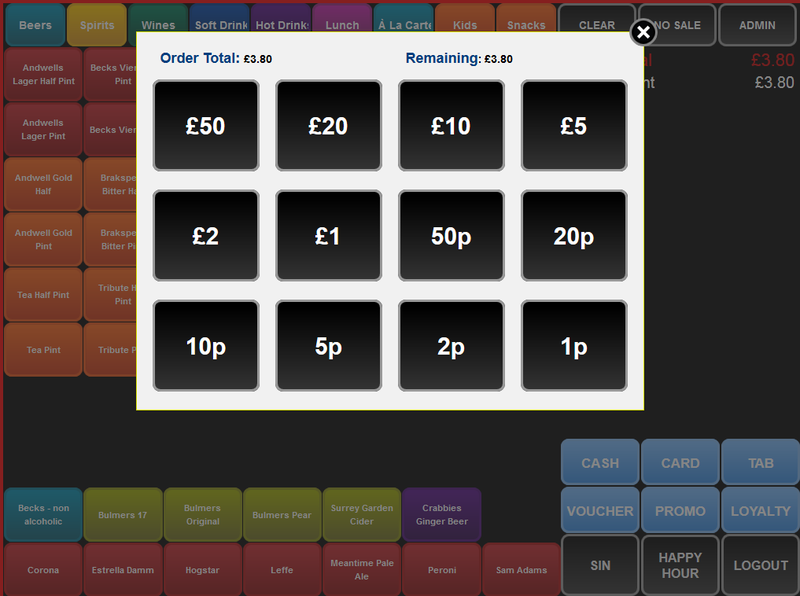 Still, our key differentiator was that we would use a web browser as the basis for the main EPoS application. This allowed us to re-use the same talent and technologies we already had in-house providing the Kobas Cloud service, and it meant that our EPoS would run on any device designed for the internet. 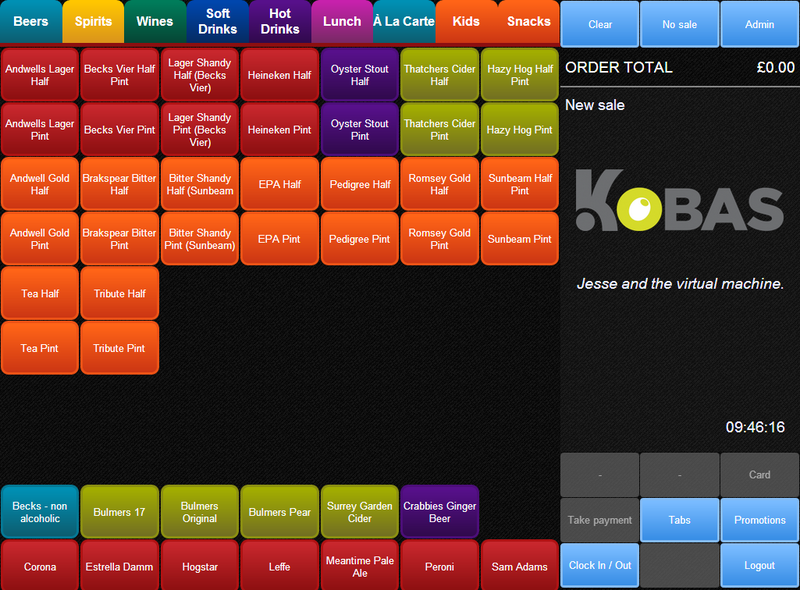 The first version of Kobas EPoS was written exclusively by our CEO James in 2012, and was a minimum viable product for the cocktail bar market. It offered basic basket and tab functionality, passed detailed sales information to our Cloud platform, and had essential time and attendance tools built into it. It could handle basic discounts, receipt printing and could even open cash drawers via those printers – not bad for a web browser! Looking back at screen shots from 2012 is very interesting for us – product evolution is obvious and rewarding! The system comprised of what is today considered to be quite a big rig, in that we had a site server in every venue to which the EPoS units connected. It was their web server, providing very fast response times over the venue LAN. It stored sales and time and attendance information locally, relaying that information to Kobas Cloud as and when the venue’s internet connection permitted, so as to ensure there was no operational dependency on the internet connection. 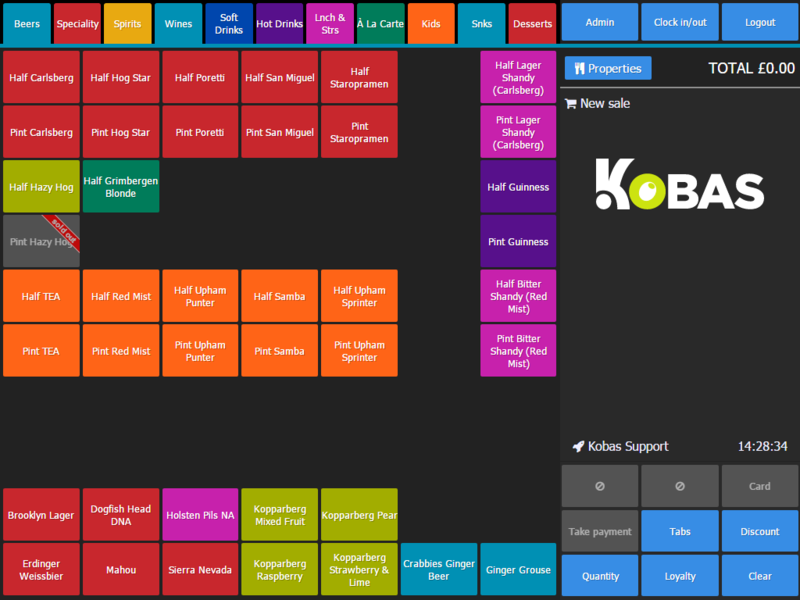 We still run similar infrastructure today which does make Kobas EPoS bulky compared with the new wave of tablet based EPoS systems, but it paves the way for a new generation of in-venue management we hope to unveil next year. Technical readers may be interested to know that Version 1 used a Windows site server running PHP 5.2 and MySQL 5. The EPoS units ran Firefox with a full-screen plug-in, and the view was designed only for 1024 x 768 – a very common EPoS screen resolution at that time. We used a Java application to permit the browser to control USB attached printers, and therefore the cash drawer. In Spring 2013 I was lucky enough to hire Jesse Baker as our Head of User Experience, and that summer he and I released Kobas EPoS version 2. That was a complete re-write of all the major EPoS components, and it was then ready for restaurants, pubs, clubs and quick service food outlets, as well as cocktail bars. The application view became scalable so it would work on any device from the smallest tablet screen to a high definition 1080p display. It supported network printers and understood concepts like PLU modification, gratuities and work docket printing in the kitchen. We released an iOS application which wrapped the browser technology in a user friendly bundle. Models such as varying tax rates for Eat-In versus Take Away were introduced. A plethora of discounts and basic stock management were added. We started to support tight PDQ integration to eliminate PDQ variances. Price bands allowed happy hour or peak pricing to be scheduled. Full end of trade Till Z information was automatically uploaded to Kobas Cloud, which vastly reduced the end of day Cash Reconciliation effort. The result was a highly marketable product which was snapped up just as fast as we could ship it and install the hardware. Exciting times! Anyone with technical sympathy may well wince at the scale of the changes we made as we transitioned to version 2 in operationally critical environments. The browsers changed from Firefox to Chrome Kiosk. The servers changed from Windows to Linux (CentOS), PHP to 5.3 and MySQL to 5.1. The servers became responsible for in-venue DNS to support roaming tablets and easy rig expansion. We added unit tests, automated deployments and remote bulk server management infrastructure to the mix. Serious stuff! Late last year we introduced full customer loyalty support with points accrual, rewards, customer profiling and branded web portals, and so version 3 was born. Customer retention and loyalty is such a vital aspect for our operators that we knew we had to build this in to the core of our offering. We really wanted to make sure it was easy for customers to join and benefit from the system, so we took steps to provide QR codes for smart phones, but also to accept RFID cards and crucially, any RFID or QR code with a unique ID. This meant that some of our London based clients even invited their customers to use their Oyster card to identify themselves. A great marketing trick and super convenient too. Notable other advances were item bar-code scanning for retail support, customer facing screen support, staff training mode, direct cash drawer opening, table zone and number assignments, much more configuration control from Kobas Cloud and yet more complicated discounts. Under the bonnet we deprecated our reliance on Java introducing our own application to allow the web browser to control EPoS hardware, and to keep us on the cutting edge, our servers were upgraded to PHP 5.6 and MariaDB 10. NodeJS is used to communicate between the main EPoS basket and the customer facing screen. None of the version 1 code remains. We are moving away from using Chrome to use a bespoke browser, but still running the WebKit engine. There’s always more to do. Kobas EPoS is already the system of choice with operators in a wide range of hospitality businesses, from fine dining restaurants, through quick service restaurants, to bars and clubs. Kobas EPoS processes millions of items, orders and pounds every month. We know we can take over £150 a minute in a single venue for sustained periods. Next we build upon this and look to help our operators to engage with their customers earlier in the process. For those with restaurants or entertainment spaces this means allowing customers to book slots online, and better deposit management. Customers should be able to order and settle up from their table. For those with smaller premises this means online menu exposure for advanced ordering, payments and delivery options. These are all substantial endeavours, but we are making deliberate progress towards improving customer engagement in these ways. It’s an exciting direction, and we’re grateful for the support and feedback from our operators as we continue this journey.